Roy Thomas and Kurt Busiek share their memories of celebrating the early days of Marvel in Invaders and Marvels! Though famous for facing front and moving forward, Marvel Comics has also been known to take a look back at its rich history from time to time. Several of its series through the years stand as reflections upon the characters and stories that made Marvel great, as well as creative vehicles to tell new tales. “There are stories that can be told in the modern idiom that simply would not have been possible under the commercial and standards considerations of those formative years,” says Marvel Senior VP – Executive Editor and resident historian Tom Brevoort. “Also, there is no other business in the world that trades so heavily upon nostalgia as comics, and there’s a considerable nostalgia for those older stories and theoretically-simpler times. 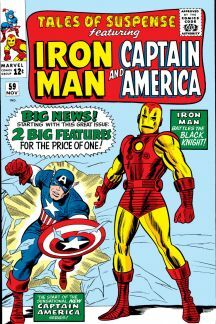 The initial revisiting of Marvel’s World War II-era history as Timely Comics came in several 1965 issues of TALES OF SUSPENSE, when Stan Lee and Jack Kirby told new tales of Captain America set in the 1940’s. That in turn set the stage for future creators to craft more stories in a similar vein and explore the possibilities of years past. The first major title to delve into Marvel’s past arrived through the work and dedication of legendary writer-editor Roy Thomas. With his great interest and passion for the Golden Age heroes and heroines of the company’s 1940’s incarnation as Timely Comics, he imagined a series wherein those characters might come together as a true team, operating during the dark days of World War II. 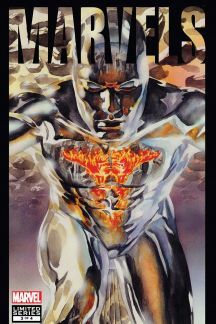 Called INVADERS, the book launched in 1975, offering not only original Timely champions such as Captain America, the Human Torch, and the Sub-Mariner, but also new characters created by Thomas such as Spitfire, Union Jack, and the Golem. The writer endowed INVADERS with everything he saw as truly inspiring about the characters and their earliest adventures. 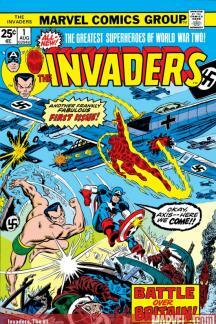 INVADERS spun its tales for four years, visiting numerous famous and infamous moments of World War II, and to this day remains the foundation stone for all the series that looked back upon Marvel’s history in similar fashion, recently receiving new life itself with ALL-NEW INVADERS by James Robinson and Leonard Kirk. As it turned out, it would be several years before another book came along and revisited the past. 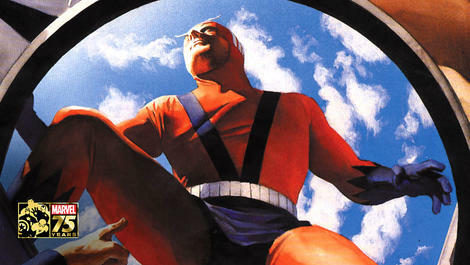 In 1994, writer Kurt Busiek and painter-illustrator Alex Ross produced a four-issue limited series that thrilled both fans and critics alike, offering a unique look at the Marvel Universe and its denizens. 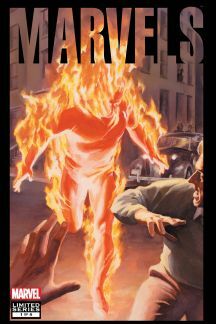 MARVELS began its narrative in the 1940’s when the costumed heroes first rushed onto the scene and a young reporter named Phil Sheldon struggled with accepting the new era he found himself living in. Busiek intended the series to not only spotlight the major players, but also the often-overlooked little guys. “The main impetus [in creating MARVELS], at least for me, was that Alex had done a number of sample paintings of characters he thought were key developments in comics at Marvel, and we wanted to cook up a project that would feature all of them,” the writer says. “Since the characters he’d chosen for his samples included the original Human Torch and Gwen Stacy, that suggested a historical project, and we batted ideas back and forth until we settled on the story we wound up doing. Alex’s samples had wound up in the hands of then-editor Marcus McLaurin, and Marc asked Alex if they were for a particular project. That spurred us to finish working out a story and send in a pitch. The story continued on into Marvel’s Silver Age, allowing Busiek and Ross to work directly with the grand adventures of the creators before them, as well as the even larger themes of those works. 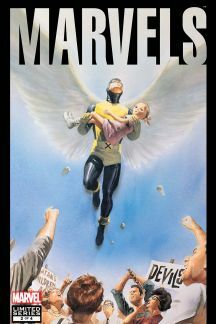 A huge success, MARVELS shared a view of famous Marvel moments unlike anything ever done before, and Busiek remains proud of the finished product, though somewhat reticent to designate its place in the company’s publishing output. Next week, the look back at Marvel’s retrospective series continues with Ed Brubaker discussing THE MARVELS PROJECT and much more!